Banning electronic devices on flights from Europe to the United States would be a big deal. Like, really big: The number of flights from Europe to the U.S. -- more than 350 a day -- make it the world's busiest international traffic corridor. Preventing passengers from bringing large electronics into the cabin -- a plan under consideration in Washington -- could disrupt the global aviation industry and slam U.S. tourism. The details of a potential expansion of the Trump administration's electronics ban are not yet clear. But the aviation and tourism industries are preparing for the worst. James Stamp, global head of aviation at KPMG, said that business and luxury travel is likely to take a significant hit from a laptop ban, unless airlines can figure out a workaround. "The North Atlantic market is highly competitive, but also highly profitable because of the links between the key financial centers of Europe and New York," he said. That means no laptops in the cabin -- a major sticking point for business travelers. Stamp noted that many businesses won't even allow employees to check a laptop. The worry for airlines is that bookings could slump. Emirates -- which was directly impacted by the first electronics ban -- said last month it was cutting back on flights to the U.S. because of weak demand. Expanding the ban to Europe would disproportionately affect U.S. airlines. Olivier Jager, CEO of travel intelligence firm ForwardKeys, said that Delta Air Lines (DAL), United Airlines (UAL) and American Airlines (AAL) have the most to lose. British Airways would also suffer, he said. Combined, the four airlines account for nearly 60% of all nonstop flights from Europe to the U.S. The broader U.S. tourism industry is also at risk. The U.S. welcomes more than 14.5 million travelers from Europe each year -- that's 40% of all overseas visitors to America, according to research firm Euromonitor. And they spend big when they come to visit. Most travelers from Europe spend between $3,000 to $4,000 per visit, according to the U.S. Travel Association. Tourists from Canada and Mexico come in larger numbers but spend $1,000 or less per visit. Visitors from Britain, Germany and France spend $31 billion each year on tourism and airfares to the U.S., according to the U.S. Travel Association. 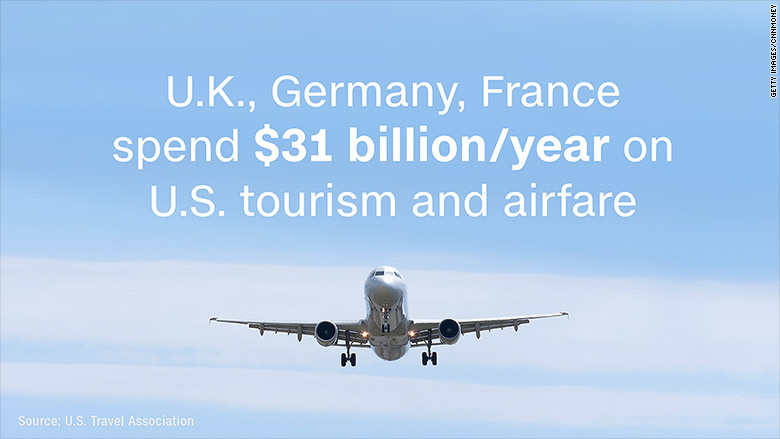 That's 15% of all overseas tourism spending in the U.S. The International Air Transport Association (IATA) has called on Trump to find alternatives, warning that expanding the ban to Europe would be misguided. IATA provided data on air traffic for this story. "The responses of Canada, the EU and Australia to the same [security] intelligence demonstrate that a ban on large electronic devices in the cabin is not the only way forward," said IATA's CEO Alexandre de Juniac in a statement on Thursday. "Indeed we believe that it is not sustainable in the long run."